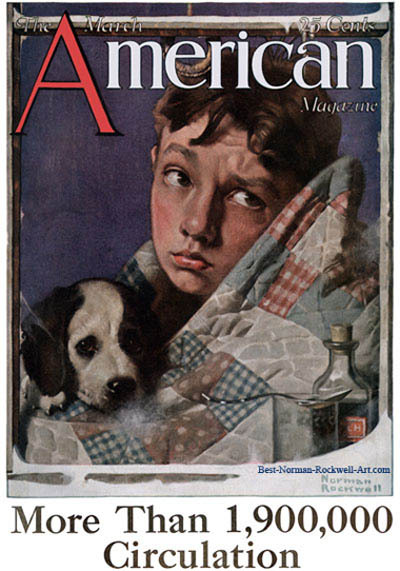 Boy and Dog in Quilt, this Norman Rockwell painting, appeared on the cover of American published March 1923. This was the seventh and last picture painted by Rockwell to appear on the American Magazine cover. 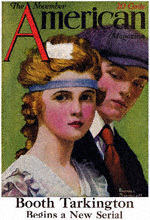 American Magazine published only seven Rockwell illustrated covers, between 1918 and 1923. Rockwell only submitted to this and other smaller magazines after the publishers of the larger magazines had declined to publish the illustration. Probably, the smaller magazines desired Rockwell's signature and art on the cover to provide a boost in newstand sales. The artist was already very popular by the time this cover appeared. Clearly, Rockwell's first choice of publication was The Saturday Evening Post. He believed that the Post cover was America's biggest showcase window for artists. Of course, his career confirmed this. The location of the original oil painting and even whether it still exists is unknown. The original cover price of twenty-five cents was fairly reasonable for a monthly published magazine of the era. The weekly publications of the time, such as the Post, Life and the Literary Digest were usually five cents. This is one of my favorite American magazine covers. Here we see a boy and his puppy looking out their bedroom window on a snowy day. Here is the complete list of all Norman Rockwell magazine covers. Both are wrapped up in a quilt, trying not to be cold. It appears that the boy is sick. In the bottom right corner, we can see a bottle of medicine with a cork stopper. Next to that bottle is a spoon and a glass. It often helps the after-taste of medicine to wash it down with a drink of some kind. The boy has taken his medicine so he will feel better. We don't know whether the dog is actually sick or not. From the look on the boy's face, he is watching his friends play in the snow. Sad eyes and pouting lips complete his expression. It's no fun being inside while your friends are outside. Even the little dog looks sad to be left out of the fun. Do You Have A Great Story, Opinion Or Contribution About Boy and Dog in Quilt? Do you have a personal story about Rosie the Riveter? Do you know the model personally? Do you have a different take on the commentary?